Onigirazu. O-ni-gi-ra-zu. It's fun to say, right? What is it? 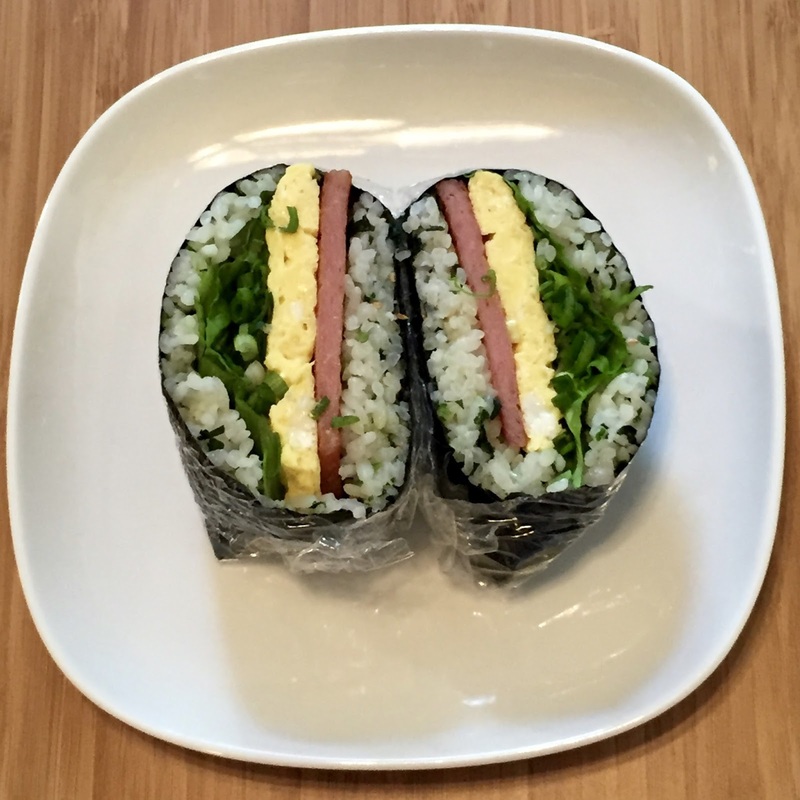 It's a Japanese rice sandwich. Perfect for any picnic, or as a portable snack. And even better - it's gluten-free and everyone will love them. No need for a fancy sushi mold or bamboo mat, just hand-folding this assembly will make a beautiful onigirazu. However, do use a short grain/sushi/sweet rice variety as it's sticky and will hold it all together. It can be white, brown, or a mix. Another trick it to have all your ingredients tailored (cut) and mis-en-place (ready to go, in order). See the picture in the upper left hand corner. This is so easy, fun, and quick to make. Let your creativity go wild! Maybe all veggies with some tofu or tempeh? Or a tunafish sandwich style? Or a bagel style with smoked salmon, cream cheese, green onions? Or more of a traditional American sandwich style? Go for it. DIRECTIONS: On a flat surface like a large cutting board, lay down a piece of plastic wrap, place shiny side of nori facing down and matte side up. In the center, loosely place a thin layer of rice (to avoid too dense of an onigirazu), followed by a thing layer of all the fillings. Work quickly, as the nori will soften up and be difficult to work with. Fold in the two opposing corners in, then tuck and fold in the opposite two corners. Follow by folding the plastic wrap around the onigirazu in the same method. Allow to sit (at room temperature, in fridge, or cooler) until ready to eat and the nori is hydrated. Once the nori is soft and hydrated, cut in half. When ready to eat, peel off the plastic wrap and enjoy! (Note: I forget to add the rice on top before folding. At first, I thought this could be a lower content carb style. I don't recommend it - that rice is needed on both sides to hold it all together. leaf lettuce, cleaned and dried, and cut to size. DIRECTIONS: On a flat surface like a large cutting board, lay down a piece of plastic wrap, place shiny side of nori facing down and matte side up. In the center, loosely place a thin layer of rice (to avoid too dense of an onigirazu), followed by a thing layer of all the fillings. Work quickly, as the nori will soften up and be difficult to work with. Fold in the two opposing corners in, then tuck and fold in the opposite two corners. Follow by folding the plastic wrap around the onigirazu in the same method. Allow to sit (at room temperature, in fridge, or cooler) until ready to eat and the nori is hydrated. Once the nori is soft and hydrated, cut in half. When ready to eat, peel off the plastic wrap and enjoy!